Now you can repair your designer style Toto brand toilet easily and economically with the JAG PLUMBING PRODUCTS replacement toilet tank handle. This handle is made to replace the Toto metal handle model number THU191. JAG Plumbing Products strives to bring on-line Customers the best replacement and repair parts. Experts in the field of plumbing repair parts; JAG Plumbing offers customers a selection of economic solutions for their every-day home plumbing repairs. The Team at JAG scours North America to bring The Home Depot customers unique, hard to find parts of the highest quality. Complete the look of your bath with this Cassidy Traditional Tank Lever. Delta makes installation a breeze for the weekend DIYer by including all mounting hardware and easy-to-understand installation instructions. You can install with confidence, knowing that Delta backs its bath hardware with a Lifetime Limited Warranty. With intricate architectural features that transcend time, Brantford accessories give any bath a polished, traditional look. Not only stylish and functional, but also helps complete the look of a coordinated bath. 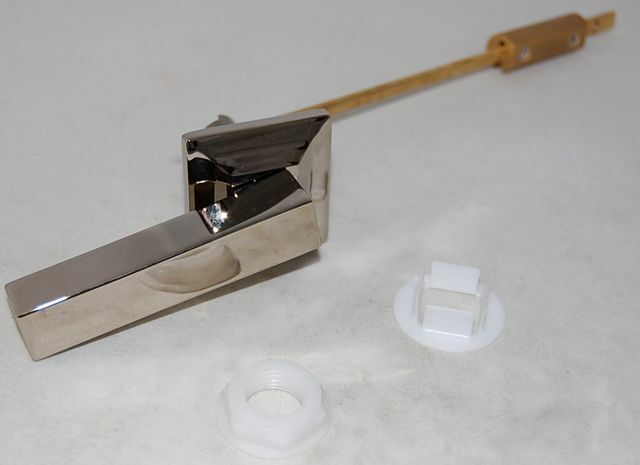 Tank Lever for Toilets in Polished Nickel Now you can repair your designer style Toto brand toilet easily and economically with the JAG PLUMBING PRODUCTS replacement toilet tank handle. This handle is made to replace the Toto metal handle model number THU191. JAG Plumbing Products strives to bring on-line Customers the best replacement and repair parts. Experts in the field of plumbing repair parts; JAG Plumbing offers customers a selection of economic solutions for their every-day home plumbing repairs. The Team at JAG scours North America to bring The Home Depot customers unique, hard to find parts of the highest quality.